When you have some drilling to do in some 2x4's or some plywood, what kind of bits do you use? If you are like me, you turn to the always reliable spade bits. A lot of the time when you need to use these bits, you are are in a dark and enclosed areas. 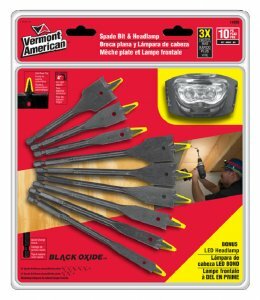 Vermont American has come out with a new 10-piece set of their most popular spade bits and included a LED headlamp to make those hard times, not so hard. The kit include six black oxide 6-inch bits ranging from 3/8” to 1”, three 4-inch “Stubby” bits in 1/2”, 3/4” and 1” diameters, and a head light. The stubby bits are ideally suited for those enclosed areas between joist applications or wherever space is at a premium, which plumbers, electricians and HVAC tradesmen will find extremely useful. These black oxide spade bits cut 3 times faster than standard spade bits due to the innovative RapidFeed™ tip. The tip is threaded like a wood screw, and allows the bit to do the work, and gives your arm a much needed rest. Visit www.vermontamerican.com to find a retailer near you.